If cooking the traditional Thanksgiving meal fills you with dread instead of holiday cheer, then let the chefs at these Chicago and suburban restaurants do the heavy lifting for you. They stay open on Thanksgiving and offer gourmet selections of classic Thanksgiving fare. Thanksgiving Menu: Acadia's menu features chestnut soup, truffle, celery “spinach salad,” smoked pork belly, onion, mustard halibut, lemon verbena crust, northern beans, cioppino turkey “saltimbocca,” corn bread pudding, salt baked carrots, sticky toffee apple cake, vanilla ice cream and smoked maple pecans. Thanksgiving Kids Menu: Kids menu offers smoked cheddar mac n’ cheese, wing dings, funnel cakes, popcorn ice cream and chocolate sauce. Thanksgiving prix-fixe menu for dine-in: Porkchop offers smoked turkey, Southern mashed potatoes, garlic roasted vegetables, cornbread, apple cranberry stuffing and dessert options. Thanksgiving menu for pickup: The pickup menu features smoked or fried turkeys, gourmet sides of southern mashed potatoes, mac and cheese, spinach, bourbon pecan cornbread stuffing and cranberry apple compote available for pre-order. Orders must be placed more than 24 hours in advance of Thanksgiving. Thanksgiving menu: The menu offers roasted heritage turkey, green bean casserole, piggy Brussels sprouts, bourbon and orange cranberry sauce, roasted spaghetti squash, chestnut foie gras stuffing, pommes roebochun and sweet potato pie. There is also a vegetarian meal option. Hours: Seatings at 11:30 a.m., 2 p.m., 4:30 p.m. and 7 p.m.
Thanksgiving menu: Big Jones offers roasted and pickled beets three ways with cottage cheese and mustard greens, cold roast beef with rye crackers and sauerkraut sauce, a dram of rutabaga bisque with candied apples and sauerkraut, pickles and sweetmeats, deep-fried turkey with giblet gravy with cranberry sauce, onion, apple and sage stuffing, mashed butterball potatoes with toasted pumpkin seeds and sourwood honey, charred Brussels sprouts with pecans, shallots, and brown butter. Their dessert options include squash pie, fresh coconut, vanilla bean ice cream, whipped cream, Elderflowerwater truffles, black walnut macaroons and pumpkin fudge. Hours: 12 p.m. – 10 p.m.
Thanksgiving menu: Drew's on Halsted features a choice of traditional lobster bisque, blackened beef skewer, duck confit risotto or butternut squash ravioli for an appetizer. You can then choose between mixed gathered greens and arugula roasted beet goat cheese salad. The main course options are roasted farm raised organic turkey, fish du jour, farfalle pasta, grilled 10-ounce New York strip steak, center cut grilled pork chop and vegan vegetable plate. Finish the meal with a dessert from this list: apple pie, pumpkin pie, New York-style cheesecake, white chocolate dried cherry bread pudding or chocolate molten lava cake with vanilla ice cream and chocolate sauce. Location: 3471 N. Elston Ave. Hours: Seatings at 12:30 p.m., 1:30 p.m., 2:45 p.m., 3:45 p.m., 5 p.m. and 5:30 p.m.
Thanksgiving menu: The buffet features arugula salad, chief’s Caesar salad, Irish cottage salad, potato salad, pasta salad and fresh fruit. The menu continues with slow roasted all-natural turkey breast, giblet gravy, herb-crusted prime rib au jus, mashed potatoes, scalloped potatoes au gratin, candied yams, house-made turkey dressing and sweet potatoes. More sides include southern style green bean casserole, sweet corn, glazed carrots, baked mac and cheese, Wisconsin cheese curds, pita chip crisps and hummus, house made tortilla chips and salsa, deviled eggs, house baked corn muffins, Irish soda bread and buttermilk biscuits. The dessert selection is varied and offers pumpkin and pecan pies, pumpkin bread pudding with salted caramel sauce, an array of assorted cakes and pastries, as well as other options. Price: Traditional buffet is $75 for adults, $68 for seniors, $37 for children 4-12, children 3 and under are free. The four course prix fixe dinner is $72 per person, $32 for children 4-12. Prix fixe dinner with a wine-pairing is $105. Thanksgiving menu: The buffet features chestnut soup with wild mushrooms and Armagnac, a selection of Belvedere cheeses, organic fruits, nuts and dates, olives Provençal, lavosh, country breads, chilled grilled shrimp cocktail, smoked lake trout, harbor point smoked salmon with traditional garnishes and pan roasted Alaskan halibut with dill, meyer lemon and late harvest Riesling. Also, the buffet offers maple honey molasses roasted Tom turkey, rhubarb cranberry compote, chestnut, pistachio stuffing, traditional gravy as well as mustard glazed and clove stuffed country ham, homemade biscuits, grain mustard, roast prime rib of beef with pan jus and horseradish cream. Also on offer is butternut squash ravioli with brown butter and rooftop sage, free range Wisconsin chicken breast, red wine, pearl onions, button mushrooms, roasted Brussels sprouts, sweet potato marshmallow gratin, mashed Yukon gold potato and thyme caramelized shallots. The buffet features a display of traditional and contemporary holiday desserts. The four-course prix fixe menu is available on the restaurant’s website. 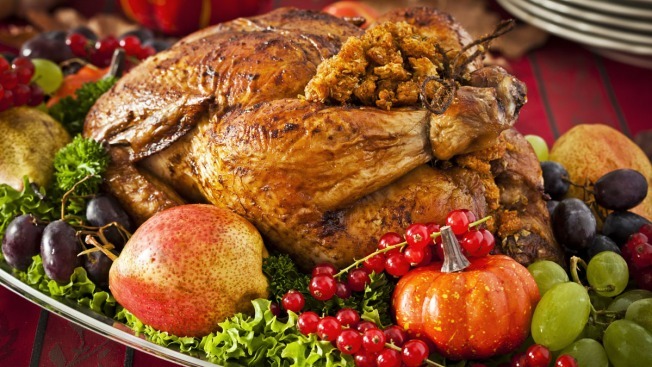 Price: $39 per person for turkey and two sides and dessert, $45 per person for prime rib and two sides and dessert, small family (6-9 people) $195, family and friends (10-14 people) $275. Thanksgiving menu: Chicago Q features free-range smoked turkey breast served with roasted turkey gravy, cranberry sauce and cornbread muffin, or prime rib that’s 14-ounce hickory smoked certified angus beef served with horseradish cream sauce and thyme beef jus, cranberry sauce and cornbread muffin. They offer a variety of sides including cornbread dressing, buttermilk mashed potatoes with turkey gravy, Brussels sprouts with house made bacon and bourbon pecan sweet potato casserole. Pumpkin and pecan pies are featured for dessert. To-go orders available if placed by Nov. 23. Hours: 12 p.m. -7 p.m.
Thanksgiving menu: Choose from pumpkin bisque, herbed creamy polenta and crab cake for an appetizer and a salad option of fingerling potato salad, peppered wagyu carpaccio salad or mesclun salad. The entrees are roasted turkey breast and leg confit with giblet gravy, cider brined pork chop, pan seared salmon and for an additional charge, 12-ounce classic filet, 40-day dry-aged 20-ounce ribeye, or 55-day dry-aged 20-ounce ribeye. All entrees are served family style with sides of whipped potato, herb stuffing, mac n’ cheese, green beans with mushroom gravy and fried onions and cranberry orange compote. The dessert selection features pumpkin cheesecake, mini apple pies and glazed chocolate cake. The kids menu includes a turkey plate, chicken fingers, pasta and a choice of vanilla or chocolate ice cream. Thanksgiving menu: Tortoise Club’s buffet features a raw bar and seafood tower with chilled shrimp cocktail, East and West Coast oyster selections, house-smoked salmon and ceviche. An artisanal cheese board offers Danish blue, brie, gruyere and sharp cheddar with a charcuterie board featuring country pâté, duck pâté and prosciutto ham. Further food offerings include butternut squash soup, house salad, kale and quinoa salad, Waldorf salad, Caprese salad and asparagus salad. The carving station serves brown sugar brined turkey with gravy and prime rib served with au jus, horseradish cream and dinner rolls. The seafood selection includes maple glazed salmon and Lake Superior whitefish. Tortoise Club also offers traditional sides and vegetables including apple-sage sausage and cornbread stuffing, celery root mashed potatoes, scalloped potatoes, roasted sweet potato, fried calamari, green beans almondine and fresh cranberry preserves. The dessert bar features pumpkin mousse spice cake roll, tortoise pie, raspberry almond cheesecake, pumpkin pie, cherry pie, spiced bourbon parsnip cake, mini cookies and a seasonal fruit platter. Thanksgiving menu: Nico Osteria offers a selection of crudo for a supplemental fee. Their menu starts with a choice between celery root soup and pear and chicory salad. The primi piatti are buckwheat pappardelle or sweet potato scarpinocc followed by an option of porcini-rubbed turkey breast or smoked pork chop served with braised Tuscan kale and truffled mashed potatoes for the secondi piatti. Desserts are pecan pie or classic pumpkin pie. Thanksgiving menu served family style: Wildfire offers homemade cornbread, deviled eggs, relish platter with spinach dip, Caesar salad, Wildorf salad and wildfire chopped salad. Meats and fish options include spit-roasted turkey, cedar planked salmon and roasted tenderloin beef. Available sides include redskin mashed potatoes, sweet potato casserole, roasted asparagus, wood roasted vegetables, wild rice and roasted Brussels sprouts with toasted hazelnuts. The desserts include pumpkin pie, maple pecan pie, key lime pie, apple streusel pie and triple layer chocolate cake. A selection of wines is available at an additional cost. There is also a gluten free menu available for the same price. In addition, a party platter menu is offered with carryout platters from salads to main courses to side dishes and desserts. Thanksgiving menu: The St. Charles buffet features a hot station, carving station, cold station and dessert station. Other Francesca’s restaurants offer an assortment of Thanksgiving Day specials including roasted butternut squash and mascarpone cream soup, Italian wedge salad with tomatoes, crumbled blue cheese and crispy pancetta as well as pumpkin filled pasta with brown butter-sage sauce, veal reduction, fresh tomatoes and parmigiano. The special also includes hand-carved turkey breast with traditional sage stuffing, sweet potato puree and cranberries and porcini rubbed rib eye with broccoli and Calabrian-style potatoes with pumpkin cheesecake for dessert. Hours: Seatings at 12 p.m., 2 p.m. and 4 p.m.
Thanksgiving menu: Chessie's features a fresh fruit assortment, peel-and-eat jumbo gulf shrimp, hot cinnamon rolls, Caesar salad and apple walnut salad. They offer traditional slow-roasted turkey with gravy, honey baked ham, fresh fillet of salmon with honey bourbon sauce, classic macaroni and cheese and crispy chicken tenders. Sides include country sage and sausage stuffing, buttery sweet corn, creamy mashed potatoes, sweet potatoes, cranberry relish, broccoli and cauliflower au gratin. Their desserts are apple pie, pumpkin pie, pecan pie, pumpkin cheesecake, plain cheesecake, assorted cookies, apple bars, and chocolate mousse cups. Thanksgiving menu served family style: Di Pescara offers crispy zucchini with lemon aioli, autumn salad, spinach and artichoke dip, as well as roasted Vermont turkey, giblet gravy, rosemary and sage stuffing, and cranberry and orange relish. More sides include sliced baked sweet potatoes, Idaho mashed potatoes, roasted Brussels sprouts and several alternate options to turkey such as almond crusted whitefish, chicken brioni and petite filet mignon for a surcharge. The desserts at DiPescara are pumpkin pie with cinnamon whipped cream, apple crostata and triple chocolate cookies. All dinners will include a boxed container of turkey. Thanksgiving menu: Menu starts with a first-course choice of baby lettuce salad with Honeycrisp apple, candied pecans, goat cheese and persimmon in a roasted pear vinaigrette or pan seared crab cakes with apples, jicama, cranberries and cole slaw or roasted butternut squash soup. The second course features choices between oven-roasted fresh herb marinated turkey breast with venison sausage stuffing, haricot vert and homemade turkey gravy or wild mushroom and caramelized onion stuffed turkey thigh with roasted garlic mashed potatoes, grilled broccolini in a turkey stock reduction. Further options include pan seared Scottish salmon with rock shrimp, Brussels sprout leaves and baby carrots in a saffron lobster sauce as well as vegetarian options available upon request. The dessert choices are pumpkin bread pudding with dulce de leche gelato in a maple crème anglaise sauce and apple pie with vanilla ice cream in a caramel sea salt sauce. Thanksgiving menu: City Gate Grille offers roasted butternut squash soup or avgolemono, mixed greens with candied pecans, dried apricots, crumbled blue cheese with cranberry-champagne vinaigrette or Caesar salad. Menu options continue with roasted turkey, brown sugar-glazed smoked ham, Dijon rosemary prime rib and oven roasted loch duart salmon. Sides include brioche stuffing, mashed potatoes, roasted honey glazed sweet potatoes, baby green beans with shallots and brown butter roasted baby carrots. Their dessert selection offers pumpkin pie, pecan tart and Greek yogurt vanilla cheesecake. Thanksgiving menu: Ivy offers a plated Thanksgiving dinner with turkey, stuffing, whipped potatoes with rolls and family style green beans with mushrooms and fried onions, cranberry relish, sweet potatoes, and a choice of pumpkin or apple pie. They also offer a Thanksgiving to-go menu; orders must be placed by Nov. 23. Thanksgiving menu: In addition to their full menu, Beelow's NorthShore is offering traditional turkey and ham dinners with all the fixins’ plus a choice of pumpkin pie or hot fudge sundae. Complimentary seconds are available on the turkey dinner. Hours: 11:30 a.m.-3:30 p.m. and 5 p.m.-8:30 p.m.
Thanksgiving menu: Wildwood offers butternut squash soup of blended creamy butternut squash and Ida red apples, finished with toasted almonds, baby spinach and romaine salad and a choice of succulent roasted turkey or roasted prime rib of beef. These dishes are accompanied by whipped sweet potatoes, French green beans, homemade cranberry sauce, maple glazed carrots and dinner rolls. For dessert the choices range from pumpkin tiramisu to butter pecan bread pudding.